JS Luwansa Hotel and Convention Center is a fairly new 4 Star hotel in Jakarta's busy business district, Kuningan. Despite its novelty and with just several weeks of operation, its popularity has skyrocketed to Jakarta's Top 10 hotels as rated by the travelers on one of the most trusted hospitality review site: Trip Advisor. As of today (16 August 2013), JS Luwansa is comfortably perched on #7 out of 248 hotels in Jakarta, thus making it the only (local) 4 Star hotel amongst the list of other older 5 Star Hotels in Jakarta. That's what I call a grand entrance! Welcome to the club, JS Luwansa! I couldn't help but to wonder why is it possible. What's the secret behind the success? I quenched my curiosity with the answer from one of the man responsible for this. He's Pak Viktor, the Executive Assitant Manager (basically second in command at the entire property) of JS Luwansa. At JS Luwansa, each member of the staff are encouraged to interact with the guests. 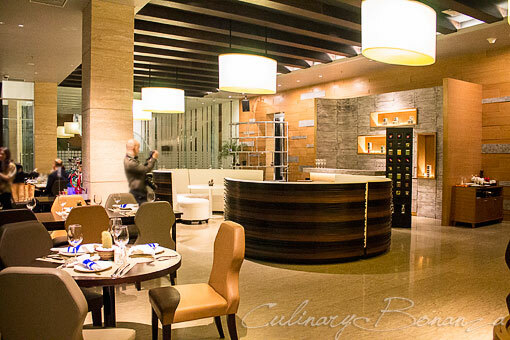 It is common for someone from the IT Department chatting with guests at the restaurant, basically the service involves everyone and for the other guests review, they are impressed with the genuine warm hospitality of the staff. JS Luwansa currently has 3 F&B outlets: Olam All-day-dining (this is the breakfast buffet venue if you stay at the hotel), Shammah Restaurant and Vin+ Gran Cru. Shammah, the name chosen by the owner(s), comes from Hebrew, which means "to be present" or "to be there". If you Google the word, most of the results will coin Shammah with the word Jehovah or Jehovah Shammah, meaning The Lord is there. Despite its name, Shammah is not a Hebrew restaurant. 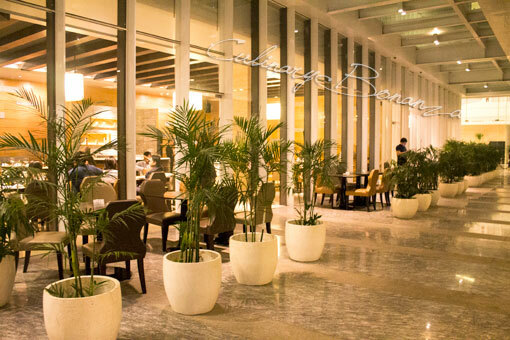 In fact, looking at the menu, the food represents European dishes with mediterranean touch. 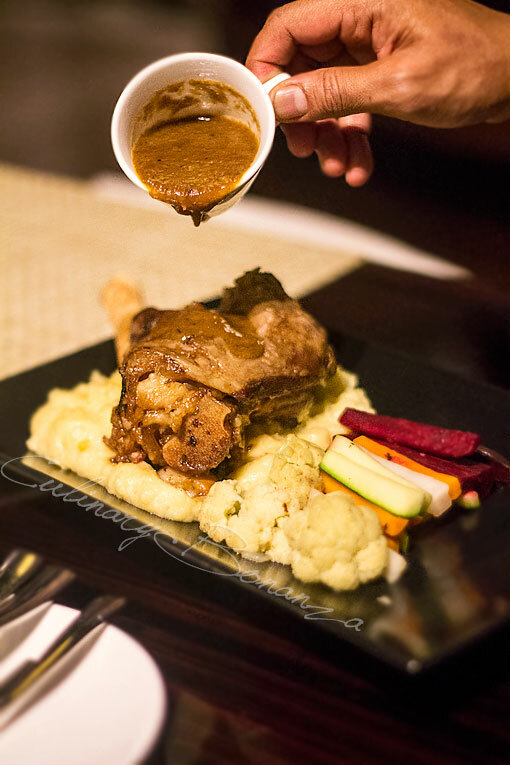 As we went for a fast-breaking dinner at Shammah Restaurant, Executive Chef Rudy Takarianta and his team had prepared for us an exquisite Ramadhan themed-menu, featuring some of the guests favourites such as the Braised Rosemary Lamb Shank and a few items from the Ramadhan specials. The generous serving, lots of meat and seafood and rice, I was well stuffed despite only trying a little bit of each. 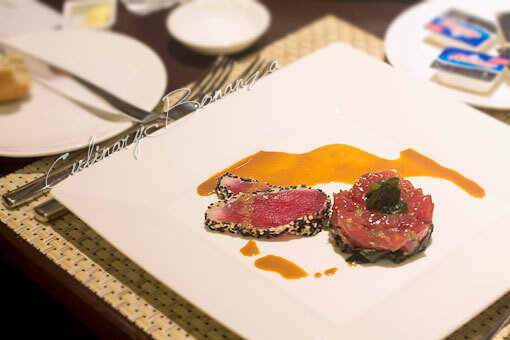 Sesame seared tuna with ginger soy dressing and ahi poke (yellowfin tuna) with shallot and scallion. Two ways of tuna preparation, one seared and one raw. The circular disc-like ahi poke hid a surprising and hot twist inside: fresh chili. 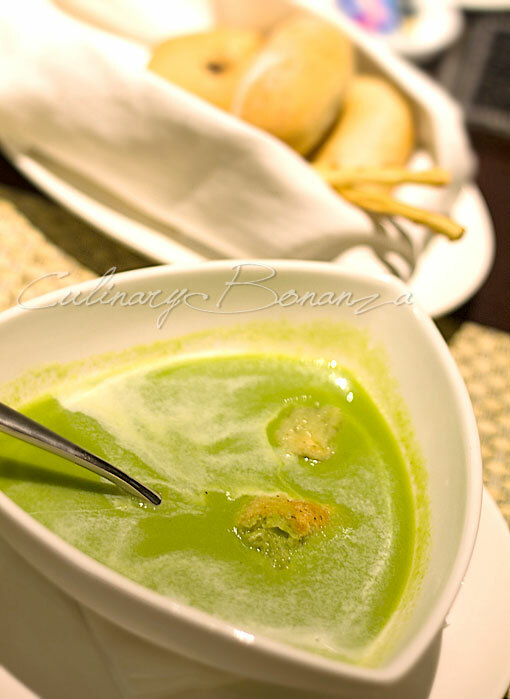 Soup: Country Peas Soup with Crispy Pancetta. The pancetta is made from beef, so it is Halal. 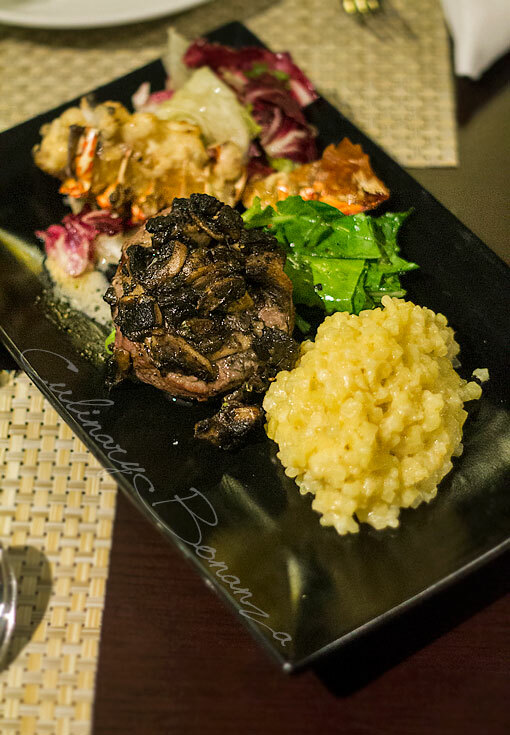 Baked lobster and mushroom crusted medallion with baby kailan, potato risotto, red wine sauce. Seared, braised, simmered in a shrimp saffron broth with peas. 3. Braised Rosemary Lamb Shank. Garlic mashed potato, vegetable bouquet and natural braising. 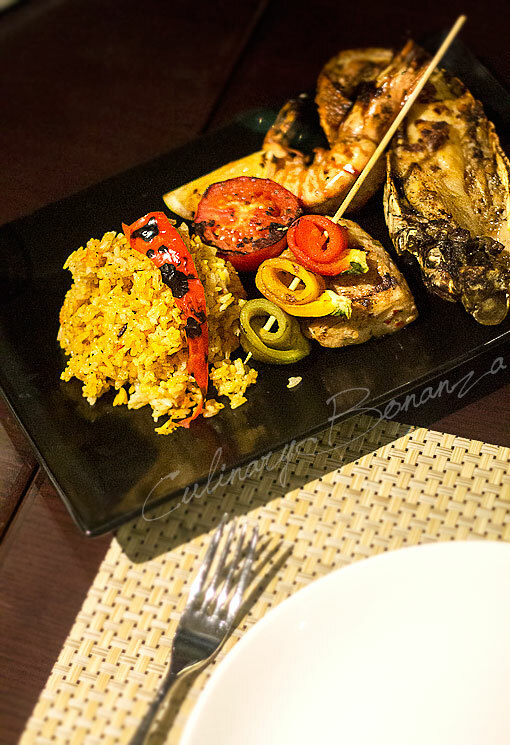 Selection of grilled lobster, prawns and snapper accompanied with grilled tomato, eggplant, paprika and rice sayadieh (a type of Syrian/Mediterranean rice dish, usually accompanied with grilled fish). Mashawi itself is the name for a classic Arab food, consisting a combination of barbecued meat or poultry and eaten with bread, rice or salad. 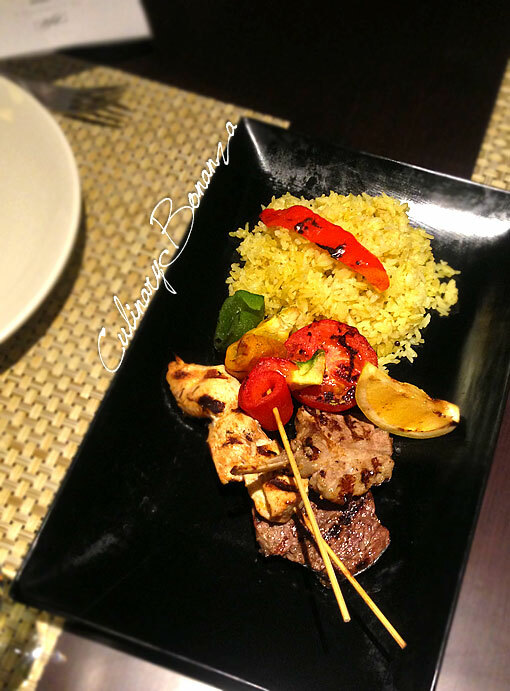 Selection of grilled tenderloin, lamb chop and chicken accompanied with grilled tomato, eggplant, paprika and rice. 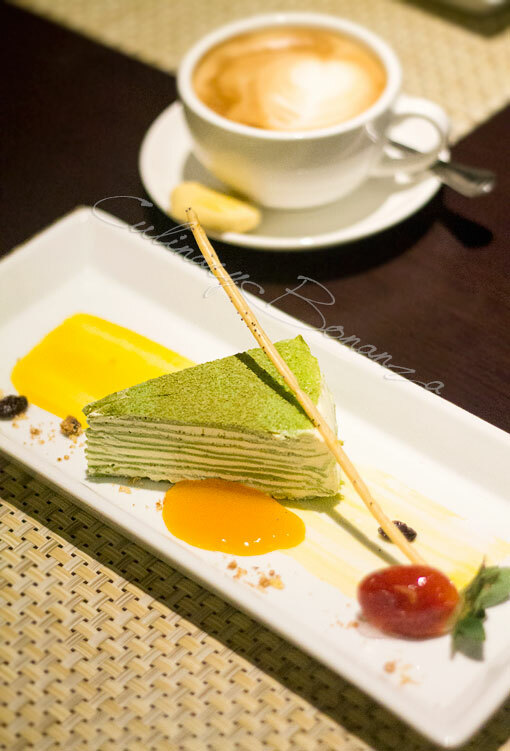 Grand marnier and citrus pastry cream layered with green tea crepe. Come here for: Dinner. 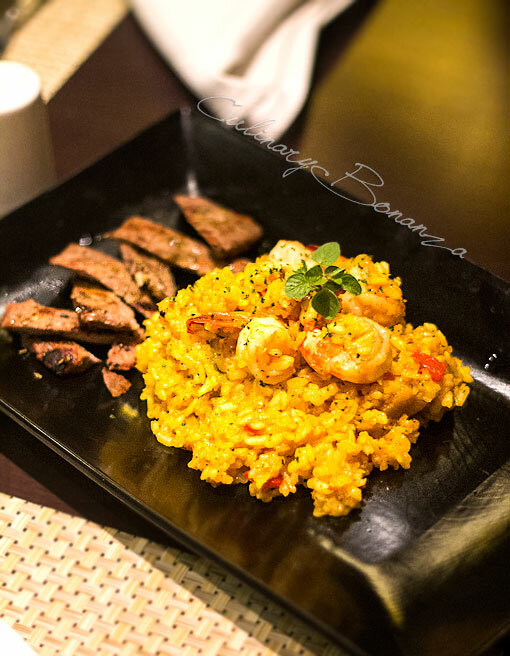 Shammah only opens for dinner, as its open hours is from 6-10PM. Its location around office buildings and Embassies, means it can be reached on foot, just in case the traffic is impossible to navigate through (as always the case in Kuningan anyway).